This new demonstration could one day lead to interstellar communication. One of the most interesting (and confusing) phenomena in quantum physics is quantum entanglement. We observe this quantum effect when we see entangled particles affect each other regardless of distance. For example, when we measure the state of one particle at a distance from another and the measurement of the state of the first instantly influences the state of the other, we have quantum entanglement. Einstein was disturbed by this, and didn’t like the idea that quantum entanglement might violate the speed of light if the particles were somehow sending each other information faster than light could travel. Therefore, he developed the idea of local realism, which assumes a pre-existing value for any possible measurement of a particle — an objective value a particle must have. This theory is based on the idea of locality, the principle that there is a minimum amount of time it takes for distant objects to influence each other, and realism, the idea that objects exist whether or not they are measured. In the 1960s, Physicist John Bell developed a famous test to determine whether particles really do influence each other in the way quantum entanglement suggests. In the Bell test, a pair of entangled particles are sent in different directions toward different locations. A device measures the state of each particle in each location, and the settings of each device are set at random; this way it’s impossible for device one to know the setting of device two at the time of measurement, and vice versa. If quantum entanglement is real, then local realism shouldn’t work, and the Bell inequality test should be violated. If scientists do observe violations of the Bell inequality test, it means that quantum mechanics violates locality, realism, or both — making local realism incorrect. In recent research, physicists have reported some of the best evidence to date that quantum entanglement exists, and the quantum world is free of the constraints of local realism. 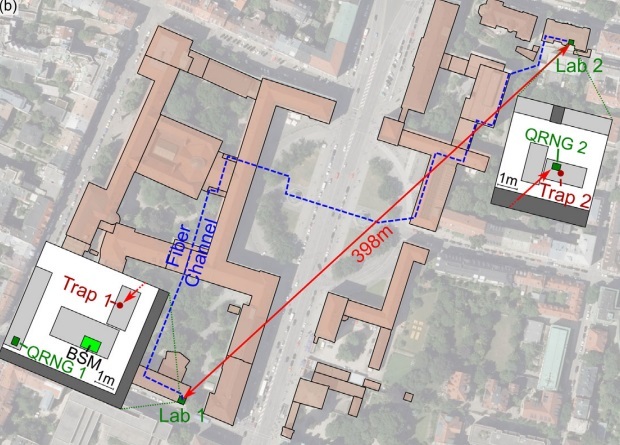 Researchers performed a Bell inequality test that was, essentially, loophole-free, and demonstrated that two atoms one-quarter of a mile apart shared correlations probably caused by quantum entanglement. According to local realism, this should be impossible. The only way the observed correlations could be explained by local realism would be if there were unknown “hidden variables” instead of quantum entanglement. And, according to the researchers, the odds of this being the case are less than one in a billion. The odds drop even further once all seven months of their accumulated data is accounted for, dipping to about one in ten quadrillions. The team concluded that the laws of the quantum world violate locality, realism, or possibly both. Although the test in this research was essentially loophole-free, all loopholes are not completely closed. One of the last possible loopholes that remain for most Bell tests has to do with how particle states are measured. It is critical that hidden variables are not somehow allowing particles to synchronize their properties by influencing the choice of measurement. This is called the freedom of choice or free-will loophole. In this research, the team used a high-speed quantum random number generator to eliminate this loophole, but the minuscule possibility of communication between random number generators or with other experimental elements technically remains possible. Other research has used humans to randomly choose numbers, relying upon the randomness of unique human minds. The physicists in this study felt that an extraterrestrial random number generator is the only way to truly close the loophole since such massive distances would prevent covert communication. There are several such extraterrestrial random number generators under development in physics labs now, intended for this purpose. Closing the loopholes matters, because scientists hope to use quantum entanglement to safely encode messages. The demands of quantum cryptography would mandate further refinement of the measurement process. Ultimately, the hope is that quantum entanglement will allow us to transmit quantum information over long distances almost instantaneously, making quantum computing and interstellar communication possible.